Live from Swaziland ... it's Saturday morning! : Somebody stinks! My “office” is at a picnic table outside the back of the El Roi Baby home and I love having meetings there. I have a weekly Supervisor meeting there, and almost all my meetings with VIP’s and visitors. I love meeting there because it allows me to spend time with our 6 to 18- month-old babies, each one cuter than the next. It also helps me get to know them and see their individual personalities starting to show even at that tender age. Our staff is amazing and are incredibly attentive to the babies, but every now and then a waft of smell will pass my nose, and then like most mom’s I start sniffing children’s butts to find out which child is responsible. Sometimes I’ll just say, “somebody stinks!”, and an Auntie will quickly find the perpetrator and immediately get the baby changed. We have 7 tiny babies under 6-months old, 31 babies who are 6-months-old to 18-months-old and we have 40 2-year-olds (those ones are being toilet trained). 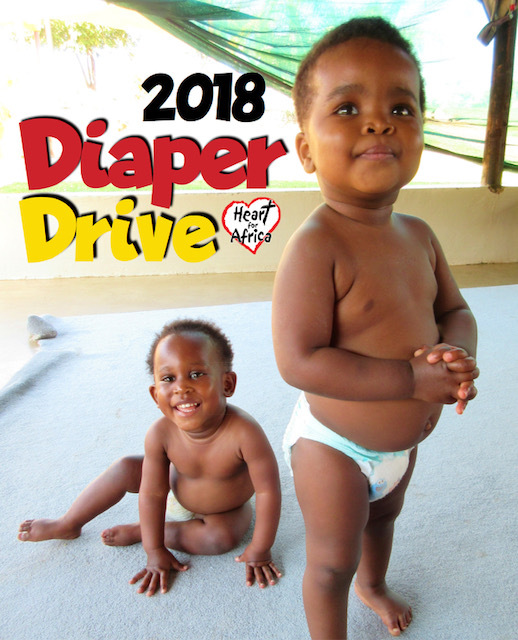 That’s 78 children who need diapers and wipes resulting in us changing almost 400 diapers every single day! Thankfully, we have not had to buy a single diaper OR wipe since last August when a 40 ft container arrived from the US, filled by friends like YOU and shipped for free by our friends at UPS. 2. Would you share this blog and any Heart for Africa social media posts relating to the 2018 Diaper Drive in the days and weeks to come? Unfortunately, we do not have a container leaving from Canada this year, but our Canadian friends and family can shop on the US Amazon site. Thank you all for your love and support and for helping us keep our babies clean and healthy. Live from Swaziland … it’s Saturday morning.